In Tibetan “Karmapa” means that person who carries out the activities of the buddhas. The 1st Karmapa Düsum Khyenpa (1110–1193) was the first to leave behind exact instructions on his own rebirth so that his heart students would be able to find his reincarnation. The 1st Karmapa therefore introduced the so-called tulku system around 900 years ago–the conscious reincarnation and recognition of high-ranking Buddhist teachers. All of the Karmapas were distinguished masters in terms of quality and scope. They were highly revered not only by Tibetans and the peoples of the entire Himalaya region but also by the followers of other schools of Tibetan Buddhism. Some of the Karmapas even functioned as teachers to Mongolian and Chinese emperors. When the 16th Karmapa fled from Tibet to Sikkim, the king of Sikkim gave him some land as a gift. On this land Rumtek Monastery was built, which is the seat in exile of the 16th Karmapa. 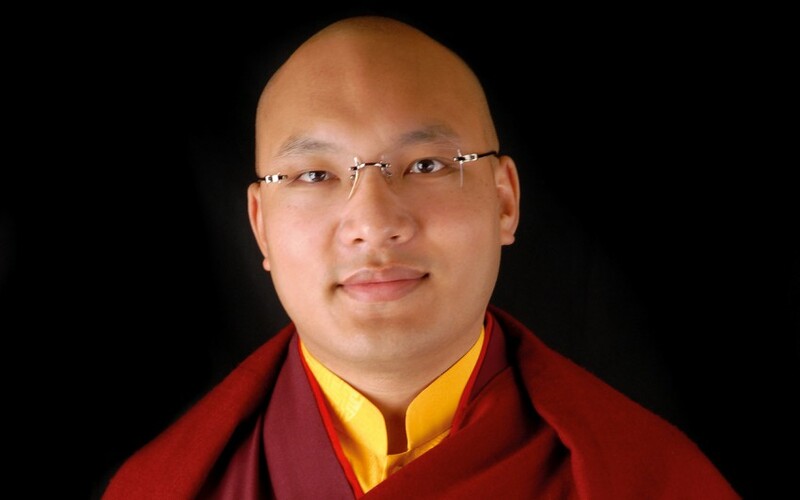 H. H. the 17th Karmapa Ogyen Trinley Dorje was born in 1985 as the child of a nomadic family in eastern Tibet. He was found on the basis of the instructions in a secret prediction letter written by the 16th Karmapa. The identity of the rebirth was confirmed not only by Tai Situ Rinpoche and Gyaltsab Rinpoche, the lineage holders and heart sons of the 16th Karmapa, but also by H.H. the 14th Dalai Lama. The Karmapa was then enthroned in 1992 in Tsurphu, the traditional seat of the Karmapa lineage in Tibet. That he would become a prominent and learned master like all Karmapas before him was already evident in his early years. His first public empowerment was given at the early age of eight, and he soon mastered all of the teachings and practices that the monks in Tsurphu were able to teach him. He even began to recognize the reincarnations of other important Kagyu lamas, such as the reincarnation of Jamgön Kongtrul Rinpoche. He also began to manage the restoration of Tsurphu Monastery, where he also had a monastic university (shedra) built. He simultaneously took over the direction of all Karma Kagyu monasteries and centres around the world. The young Karmapa became a magnet for Tibetans and for students and followers from many other countries. At the age of 14 the Karmapa decided to flee Tibet and go to India, a very difficult and very dangerous endeavour. He took this risk because he was not allowed to bring his teachers from India to Tibet, which was a hindrance to his education. The Karmapa also foresaw that the Chinese would want to pit him against H.H. the 14th Dalai Lama in the future. The world watched in awe as the 14-year old Karmapa arrived in Dharmasala in January 2000, where he took refuge at the feet of H.H. the 14th Dalai Lama. The Indian Government and the Indian people received him as an honoured guest. The Karmapa has resided since then in Gyuto Monastery near Dharmsala. At Gyuto he received a traditional monastic education and all of the necessary transmissions under the direction of Kagyu masters and H.H. the 14th Dalai Lama. The Karmapa assumed responsibility for the Karma Kagyu schools at a very early stage. Within a very short period of time, he brought about reforms and progressive changes to the studies and discipline of the Karma Kagyu monasteries. The Kagyu Monlam was chosen by him as the main platform for his activities. Kagyu Monlam is a prayer festival held annually in Bodh Gaya and attracts thousands of monks, nuns, and lay followers from around the world. The International Kagyu Monlam Chenmo is famous for its inspiring prayers and instructions, which are simultaneously interpreted into 12 languages, and for the discipline practiced there and for the internationality of the participants. The Karmapa began by instructing the monks and the nuns on how they should dress, sit down, move, and correctly prostrate. This was followed by instructions on meditation, practice, and prayers. In 2007, the Karmapa asked his monasteries to stop serving meat after becoming a vegetarian himself several years before. The Karmapa explained that it was necessary to practice this in order to develop genuine compassion and reduce suffering. At the end of his instructions, thousands of monks, nuns, and lay people raised their hands and committed themselves to becoming vegetarians. This is a good example of how the Karmapa teaches by using himself as a role model. In 2014, the Karmapa set into motion a historical development to strengthen the role of women in Tibetan Buddhism. One of the first things he did was to establish an annual “Arya Kshema”, a winter dharma meeting for Karma Kagyu nuns. Through this, the Karmapa has improved the education nuns receive. Around 300 Karma Kagyu nuns attended the meeting. For the first time ever, they engaged in debates and took over all of the activities themselves. This included such things as leading rituals, recitations, and disciplining the entire gathering–things that were previously reserved for their male counterparts. Then at the beginning of 2015, H.H. the 17th Karmapa announced that the process to institute the full ordination for women would begin in 2016. This brought an end to the long-standing debate on whether and how to reinstate the full ordination of nuns in Tibetan Buddhism. The Karmapa regards the protecting of the environment as the equivalent of dharma practice. It is his wish that Buddhist monasteries initiate environmental projects, especially in light of the enormous impact that climate change is having on the Himalayan region. In response to this, the Karmapa founded “Khoryug” – which means “environment” in Tibetan – in 2009. It is a cooperative group of ecological Buddhist monasteries in the Himalayas headed by the Karmapa himself. This network comprises 55 Buddhist monasteries of monks and nuns that work together on environmental projects in the Himalayan region. He has published environmental directives for the Karma Kagyu community and a popular book called “One Hundred and Eight Things You Can Do To Help the Environment”. 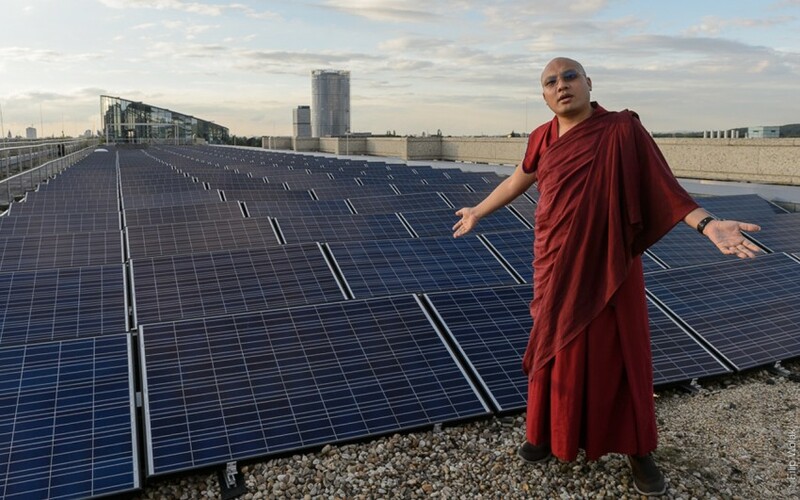 The Karmapa also encourages people especially in industrial countries to use less resources and to lead a simpler life. H.H. Karmapa is a regular and welcome guest in Tibetan schools and universities. He has become a role model for courage and dedication and for his fervent preservation of authentic traditions. His receptiveness to positive modern influences has made him especially popular among Tibetans and the younger generation. Two very influential books came out of talks that were held between the Karmapa and groups of young people: “The Future is Now” and “The Heart is Noble”. On several occasions the Karmapa has said that he feels a strong connection to young people and that he really likes discussing with them. His approach is as much traditional and authentic as it is innovative and artistic. For example, in Bodh Gaya in January 2014, he performed the Guru Padmasambhava Lama dance exactly, authentically, and traditionally. But at the same time he invited nuns to take part in the sacred dances, which was previously unheard of in the Karma Kagyu tradition! These dances are among the most beneficial and magnificent presentations of Tibetan Buddhist culture. Tibetans call the Karmapa the “Star of Tibet”, a name well-suited to his commitment and his visions. The Karmapa is not only a scholar and a master in all areas of Tibetan Buddhist studies. His poems, paintings, calligraphies, theatre plays, and songs, which he performs with artists of the Tibetan Institute of Performing Arts (TIPA), are also highly acclaimed. He is studying the languages and cultures of various Asian and Western civilizations, and is learning Sanskrit, Hindi, Chinese, Korean, Vietnamese, and English. The Karmapa is also very interested in modern science and has actively participated in the “Mind and Life” conferences with H.H. the Dalai Lama. H.H. the 16th Karmapa had visited many places in Europe and North America, where he founded a large number of Karma Kagyu groups and centres. The followers and supporters of the 16th Karmapa then began to urge the 17th Karmapa to visit them. His first trip to the West was in May 2008. He went to the USA and gave teachings in many dharma centres and public auditoriums. The Karmapa was able to visit the USA again in 2011 and in 2015. In 2014 – at the invitation of Kamalashila Institute and the Karma Kagyü Gemeinschaft Deutschland e.V. – H.H. the 17th Karmapa travelled to Europe for the first time. This was the fulfilment of one of his most cherished wishes. Like his predecessor, the Karmapa feels a strong, personal connection to this continent. He often says that he was a farmer in Europe in one of his previous incarnations. His first destination was Kamalashila Institute in Germany–his main seat in Europe–where he blessed the stupa. For three days in an auditorium near Kamalashila, the Karmapa gave valuable dharma teachings and empowerments to an audience from around the world. His Holiness then went on to visit the capital city of Berlin and taught there for four more days. The Karmapa was able to come to Germany again in 2015 at the invitation of Kamalashila Institute and the Karma Kagyü Gemeinschaft Deutschland e.V., where he gave lectures and empowerments in the nearby city of Bonn.